A leaky fridge is never a welcome sight – and with all the potential causes for that water puddling beneath it, you could spend the better part of an afternoon just trying to figure out just why the refrigerator is leaking. 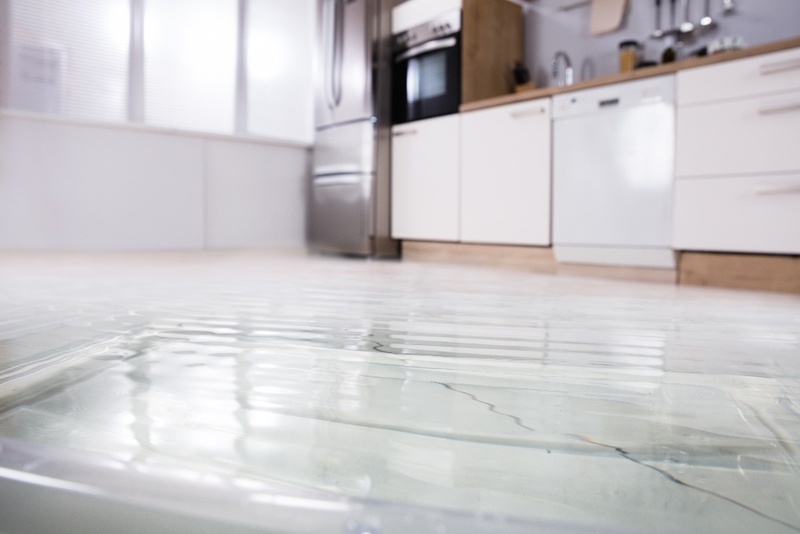 While it may seem alarming at first – it’s logical to jump to the conclusion that ice may be melting, and that your food is being stored at an unsafe temperature – the good news is that when a fridge is leaking, the culprit is often simply a blocked drain or water line. We’re here to break down exactly what causes a leaking refrigerator, and show you what you can do to fix it in this convenient, step-by-step guide. One way to determine why your fridge is leaking, is simply to open up the door and let it go. Does it swing back shut automatically? If not, your fridge may not be completely level, or even slightly tilted forward. This can cause problems when it comes to condensation draining inside the appliance, because the drain system relies on gravity and angles to guide the collected runoff water. The makers designed your fridge to tilt slightly backwards, both to help the draining water get to the right place, as well as to get that door to swing shut without much effort on your part. Fortunately, it shouldn’t take much effort on your part to set things straight (so to speak). You will need two strong pairs of hands to lift the front of the refrigerator up off the ground. Then, just unscrew the two front legs a bit to extend them. Use a level to make sure that your fridge is level horizontally, and you’re good to go. Another possible reason for a leaky fridge is that the condensation drain hole may be clogged or blocked. You’ll want to consult your owner’s manual to locate the condensation drain if you don’t see it right away, but it’s usually located towards the rear bottom of your fridge. You’ll see that the fridge interior is designed to try and prevent food items from getting too close to that drain, but with time and the jostling of all the different things you put in there, it’s possible that bits of food may have worked their way into the drain and are causing a blockage. Sometimes, even without food getting in there, mold can grow, causing a similar effect. The solution? First things first: unplug your refrigerator, then just slip a Q-Tip into the drain hole and give it a good clean. For more stubborn blockages, you may try snaking some plastic wire in there to get deeper – but bear in mind not to use metal or anything sharp. If neither of the above seems to be the issue, or if you’ve tried them and still, your refrigerator is leaking, the next step is to check to see if the drain line inside the fridge is blocked. Unplug the fridge and move it away from the wall, being careful not to disturb or disconnect the water intake lines running from the wall to the fridge. Then, allow the fridge to defrost for a couple hours. When the fridge has been unplugged for an hour or two, use a socket wrench to open up the metal panel on the lower back end of the fridge. After pulling off the panel, look inside and find the drain coming from inside the fridge. It will be attached to the top of the paneling, coming down at an angle, and should look like a little water slide. Loosen and remove the top of the drain from the fridge, and pull off the grommet – the top rubber piece that should have two little rubber arms on it. If you squeeze the grommet, you’ll see that the opening may have gunk and other buildup inside. Just rinse it with warm soapy water, and reattach. Another potential problem could be the water supply line. This can also be the likely culprit if you’re not getting a lot of ice in the ice machine, or if the water dispenser doesn’t flow well. Unplug your fridge and find the water shut-off valve, which should be located nearby or beneath your sink. Turn off the water supply via the shut-off valve. Then, check the supply lines for any breaks or tears, as well as blockages. If you do discover a blockage but see that it’s clear, that means it’s frozen. You can fix this by leaving the refrigerator unplugged for a couple hours to thaw the blockage out. It’s best to have another cooler on hand to prevent food spoilage. In the case of a break or tear, or of a blockage that’s not clear, you’ll need to replace the supply line. For this, we highly recommend you call a professional. 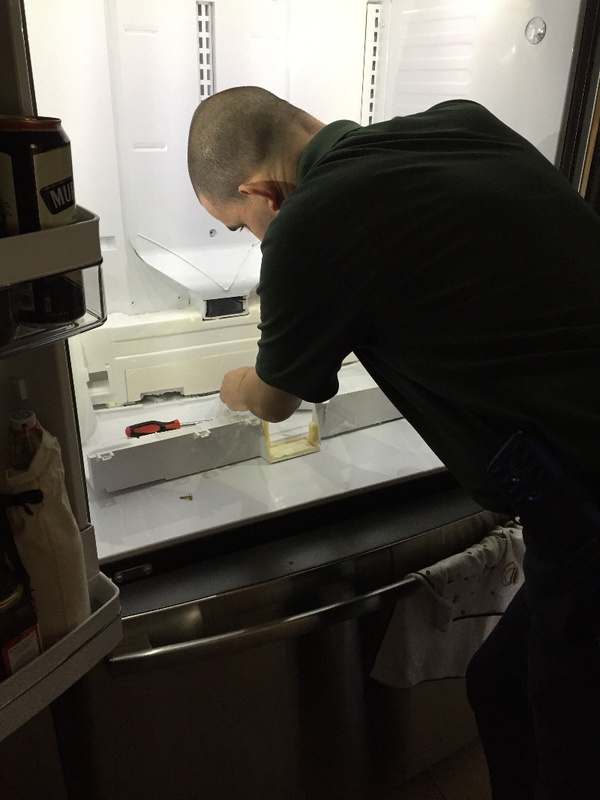 We specialize in refrigerator repair, so if your fridge is leaking, we can get that fixed up for you in no time. Just hop online to book the time slot that’s best for you, and a certified Puls technician will arrive at your door – often in just a matter of hours – to fully diagnose your broken fridge. Plus, if you choose to go ahead with a repair, we will throw in our comprehensive $79 diagnostic for free. Visit our website today and you can save 5% off your first service with us. We fix washers, dryers, refrigerators, ovens, and more. And with our 90-day guarantee on parts and labor, you can be sure the job is being done right. So, what are you waiting for? Book an appointment now to have a certified Puls technician get your fridge running at 100% again in no time.